​Video News/Press Releases are being Offered as a Monthly Service..
Hi Nick Mancuso here, Thanks for stopping by our JV Page.. Here's a brand new video service biz-box your subscribers will love.. They could use this turn-key package to generate A New Video Income Stream or Specialize in this exploding new video service (While Outsourcing All The Video Work for a Fraction of what they'll charge for it).. This is a New Video Marketing Method that is already making marketers great money.. And clients get incredible value from it.. Your subscribers could brand this whole business pack as their own and get started tomorrow.. Lends itself perfectly to a Recurring Monthly Video Service (training/examples included)..
for your support on this one and of course look forward to supporting your upcoming launches as well.. This is a Limited 4-Day Special that's Proven to Compel your list to Jump All Over it.. The time is perfect for this emerging video service that combines TWO Proven Powerful Marketing Methods.. The Press Release and News-Format Videos. This is a no brainer for those currently providing video services (or those who want to start) or even those that want to add another income stream to their existing marketing business, then this is something they'll want add to their arsenal.. 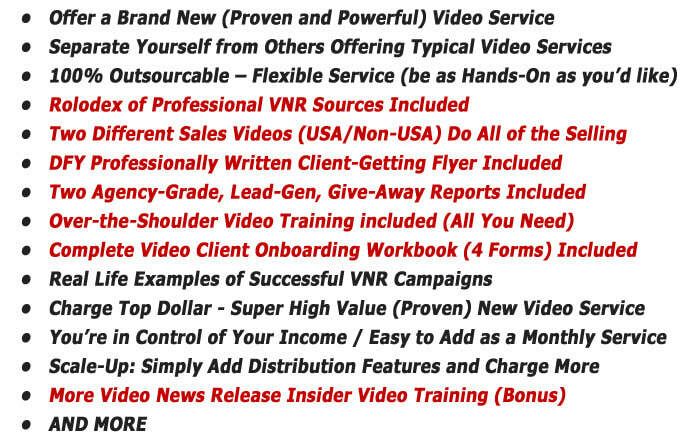 The First-Ever Video News Release (VNR) Service Pack and Biz-Box.. A complete collection of all the components to get one started offering this unique (but Proven) New Video Service.. Best of all its 100% Outsourceable.. Easily outsource all the time consuming video work with the included Video Providers Rolodex of The Top Rated VNR service providers.. The pack also includes Six Other Professionally Designed, Researched and Written VNR Agency Elements along with training to have their business up and collecting checks in no time at all..
(Also Includes a Client Magnet PR Software Utility and All Professionally Written VNR Content). new video income streams starting Today..
Service Providers Rolodex so you do None of the Video work at all. Everything you Need to Plug & Profit with "Video News Releases"..